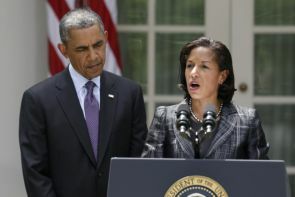 Susan Rice, the tough-talking United States Ambassador to the UN, was named as President Barack Obama's new National Security Advisor, in a significant shakeup to the White House foreign policy team. Considered a strong advocate of India-US relationship, 48-year-old Rice would take over as national security advisor in early July. She would replace 58-year-old Tom Donilon. Making a formal announcement in this regard at the Rose Garden of the White House, Obama hailed Rice as an "exemplary public servant". Obama said Rice is one of the most qualified and experienced experts in the field of foreign policy in the country. "Put simply, Susan exemplifies the finest tradition of American diplomacy and leadership. So thank you, Susan, for being willing to take on this next assignment. I'm absolutely confident that you're going to hit the ground running," Obama said in his Rose Garden announcement. Someone who has served with distinction as the US ambassador to the UN, he said Rice is the most suitable to be his national security advisor. "With her background as a scholar, Susan understands that there's no substitute for American leadership. She is at once passionate and pragmatic. I think everybody understands Susan is a fierce champion for justice and human dignity, but she's also mindful that we have to exercise our power wisely and deliberately," Obama said. "She's helped to put in place tough sanctions on Iran and North Korea. She has defended Israel. She has stood up for innocent civilians from Libya to Cote d'Ivoire. She's supported an independent South Sudan. She has raised her voice for human rights, including women's rights," he said. "And I know that after years of commuting to New York while Ian, Jake and Maris stayed here in Washington, you will be the first person ever in this job who will see their family more -- (laughter) -- by taking the national security adviser's job. A former Brookings Institute Fellow, Rice has been a key part of Obama's foreign policy team ever since he announced his presidential run in 2007. Rice is well known for advocating strong relationship with India. As the US Ambassador to the UN, Rice, maintained a close personal relationship with Hardeep Puri, the then Indian Ambassador to the UN, when India was a member of the UN Security Council for two years. Rice's appointment has been welcomed by US lawmakers. "Susan Rice has the right combination of strategic vision and credentials to serve as a national security adviser," House Armed Services Committee Ranking Member Congressman Adam Smith said.